All in One ! 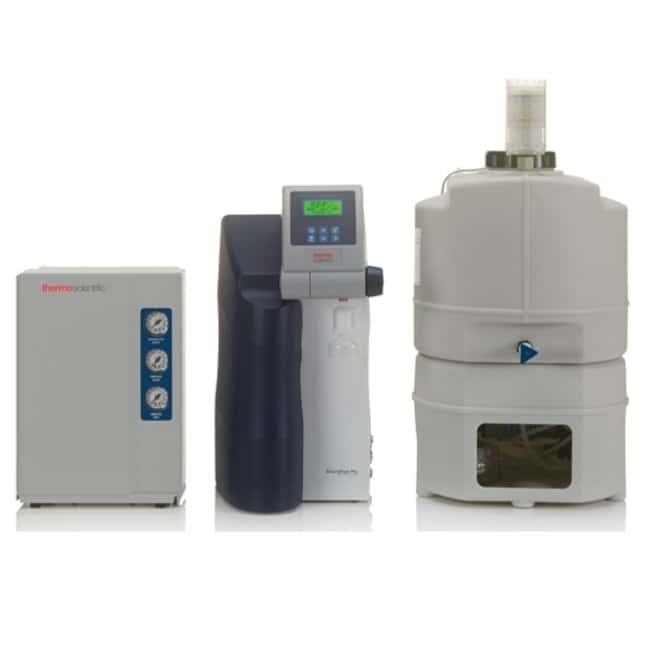 The Smart2Pure Pro system is a compact system which converts tap water to into ASTM Type 1. The Smart2Pure Pro UV/UF 16 LPH offers the choice of a 30 L or 60 L reservoir for customizable storage capacity and ability to dispense both ASTM Type 1 and Type II water. Water purification progresses through independent cartridges with Aquastop quick connects for fast replacement. Module 2 includes a polishing cartridge that contains high-quality ultrapure resin for consistent purity and long cartridge life. Dispensing is easy and features variable speed to control flow. The display can be tilted for optimal reading. Inline ultrafilter with large surface area to remove endotoxins and nucleases. Large opening allows easy and effective cleaning by hand. Sterile venting filter/reservoir overflow protects against contamination by microorganisms. Optional CO2 absorber prevents TOC value increases from drawn-in CO2. Polyethylene reservoir is opaque to light. Recirculation pump protects the high purity water from bacterial growth during standstills and maintains the low conductivity value. Wall-mount is optional for simple space-savings. Conical bottom outlet allows for complete draining and efficient cleaning and disinfection.